I began djing because of my older brother. We had a Technic and a Kenwood turntable, he was a party rocker from the mid 80's up till the early 90's. I remember being a nosey little kid riding my bike back and forth of the garage, where he would be scratching, while an MC was rapping. I was sooo interested, when he would be gone, I was copying what he was doing. When I started in 1995, he saw how dedicated I was, and he surprised me by purchasing another Technic 1200 for me. When I had the two turntables set-up, I knew instantly "It's On!" Mixing and throwing in a little scratch here and there was my style. From only watching my big brother from my younger days, that's all the coaching I ever had, no videos cuz I couldn't afford them, and no dj friend's cuz I was always working or asleep. Back in Feburary, He won 1st Place at the Guitar Center(Covina) Finals. 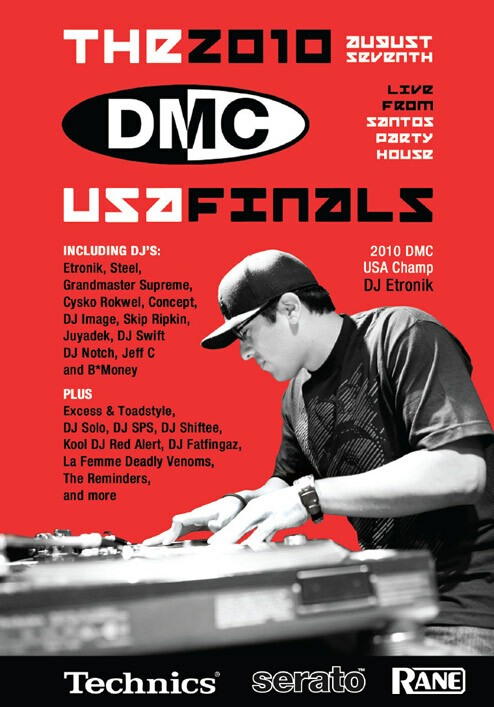 In March, Etronik successfully defended his 2008 Winter Music Conference Scratch Title by winning the 2009 Winter Music Conference Scratch Title in Miami. In May, Etronik was crowned 1st Place for The Ultimate DJ L.A. Competition which was held at the Level3 Nightclub in Hollywood.